Headstone accessories are sometimes an afterthought once the stone has been chosen, but they can really enhance the original design. 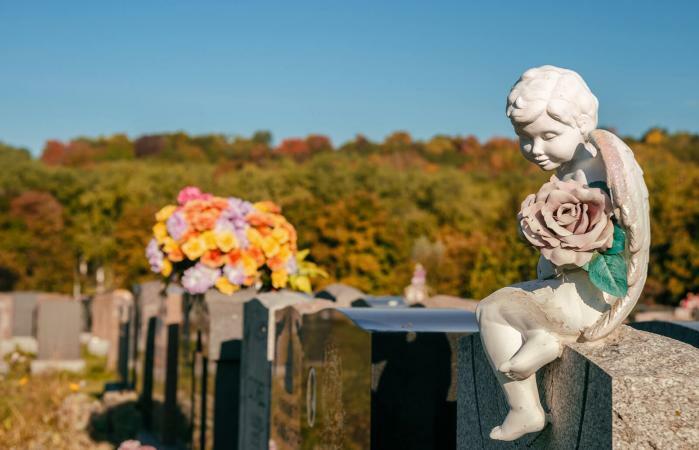 If you're looking for ways to pay tribute to a loved one who has passed on, take a look at the different types of accessories that can be added to virtually any headstone. Adding a photo of a loved one to his or her headstone is a wonderful way to further personalize that marker. This is traditionally done by transferring a photo image onto a ceramic base, where the pigments are then baked in. Once the piece is finished, it can be mounted directly onto the headstone, and the colors will not fade due to weather or sunlight. Prices for ceramic photos average around $100.00 for small photos. However, the cost does increase if you want a larger photo, so you could pay from $200 to $500.00. 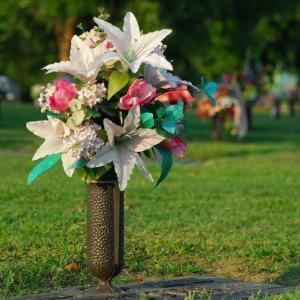 Vases for flowers can be set above ground and mounted to the headstone, or they can be set in the ground. Most above-ground vases are created from solid granite, but you can also purchase vases made from bronze to go with a bronze headstone. It's important to make sure the area where you want to mount the vase is large enough to fit the vase's base. The vase is typically mounted using an epoxy glue. In-ground vases are usually made from aluminum or zinc and are surrounded by a protective outer casing. Most bronze marker manufacturers sell vases designed specifically to fit their products. If you're adding a vase to an existing marker, it's important to make sure you purchase one that will fit a particular manufacturer's product. 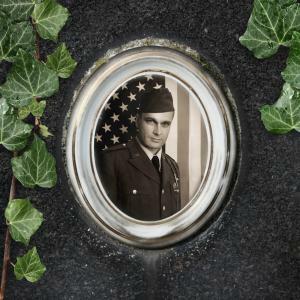 Some companies are able to identify the headstone's maker if you provide a photo of it. Depending on the material and the size of the vase, prices start at just under $100, but larger vases can cost much more. Many people purchase vases in sets, and this will naturally double the final price. On occasion, a vase may need to be replaced. It may have deteriorated, been broken or damaged or even worse, it may have been vandalized or stolen. When a replacement vase is needed, there are many options available. If you choose not to go with a granite or bronze vase again, there are replacement vases made from polycarbonate that have a bronze or granite look. This is a less expensive option as well. On average, the larger replacement vases range from $100 to $200. Candles are the most common memorial lights, and you can purchase special holders to protect them from wind and rain. The holders are made from lightweight aluminum and a see-through lens, and you can usually select the color of lens you prefer. The holder is either mounted on the stone or is placed in the ground using its metal stake. Solar-powered lights are a more recent addition, but they are very convenient and quite lovely. The lights are made from an acrylic figure attached to a granite base. The light charges during the day and displays at night, so it's important that it received plenty of sunlight. This type of light wouldn't work as well at a gravesite beneath a shady tree. The cost for candle holders ranges from $50.00 to $200.00. Solar lights start at about $35 and go up from there. Popular styles include crosses and angels. Statues make a lovely addition to most monuments. Many are religious in nature, with angels, the Virgin Mary and Jesus among the most popular themes. Statues are made from various materials such as Italian marble and granite, but bonded marble has become very popular because it is more durable than natural marble. Bonded marble is created by mixing marble powder with resin and then pouring this mix into a statue mold. Prices for bonded marble statues generally start around $100.00, but you might pay $1000.00 to $2500.00 (or more) depending on the size of the statue. Hand-carved granite or marble statues are usually more expensive and can cost thousands of dollars depending on the size. If you're looking for a way to accessorize a headstone without making a permanent change, stainless steel holders can make it easy to decorate any headstone. Flower pot holders - These stainless steel holders can be clipped directly onto the headstone or driven into the ground flush with the marker. Some people like to purchase them in pairs to go on either side of the stone. Prices for these holders range from about $18.00 for a single holder to $30.00 for a pair. Vase holders - These are similar to pot holders and allow you to attach a vase to stone or stake it into the ground next to it. Prices run about $15.00 to $18.00 each. Flag holders - You can honor a soldier's grave with a patriotic flag. These holders just stake into the ground flush with the headstone and cost about $18.00 each. Wreath hangers - There are models that clip onto the stone or stake directly into the ground. Prices range from $12.00 to $18.00. 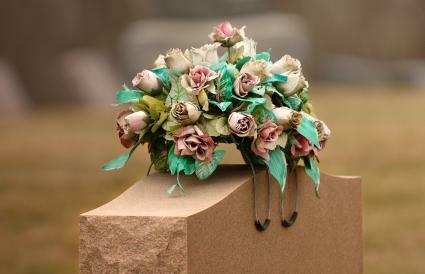 Headstone saddles - These are the metal brackets that hold a floral arrangement on top of a headstone. They cost about $10.00 each. Any company that sells monuments will also be able to supply you with the accessories mentioned here. If you prefer to shop on your own without feeling pressured to make a purchase, you might like to visit one of the following websites. Everlife Memorials - This company sells quality, vases, statues, ceramic photos and more. They also carry bronze replacement vases. Headstoneware - This site mainly specializes in hangers and holders. Buy Memorials - Here you'll find an assortment of vases, headstone pictures and frames, and high-end statuary. Bott and Sons - This company offers a variety of vases and photo memorials, including laser-engraved, anodized aluminum plates. Whether or not to accessorize a headstone is a matter of personal choice. You can purchase a perfectly lovely headstone without any accessories at all, but sometimes that little something extra helps express your feelings just a little bit better. The best thing about any of these accessories is that you can always add them later on as a continuing tribute to your loved one.